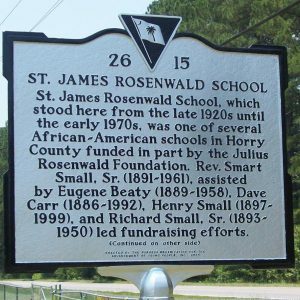 The school, which was located at this site from the late 1920s until the early 1970s, was one of several Rosenwald schools in the county. Rev. Smart Small, Sr. (1891-1961), assisted by Eugene Beaty (1889-1958), Dave Carr (1886-1992), Henry Small (1897-1999), and Richard Small, Sr. (1893-1950) led fundraising efforts. It closed in 1970 after desegregation. Marker erected by the Burgess Organization for the Advancement of Young People, Inc., 2005.